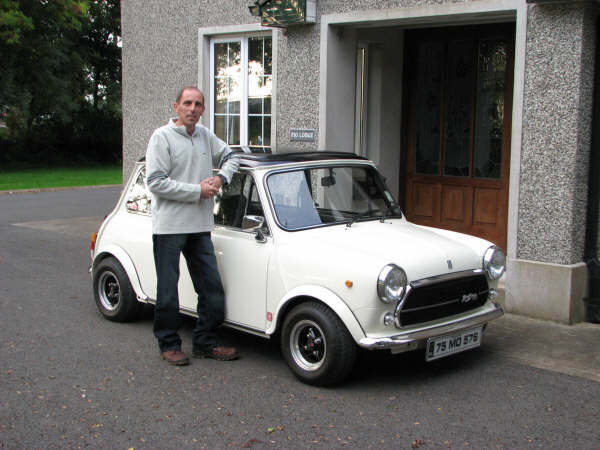 For our third featured member, Jon was extremely eager to tell us a bit about himself, and his very very special Innocenti Mini. Despite Jon being exiled in the outer regions of Mayo, he’s still one of the most active online members of our Club. Click the ‘Read More’ link below to see the answers Jon gave to our list of all important questions, and of course, to see more of Jon and his pride and joy. Mayo, the county, not the sauce! A 1975 Mini Cooper Innocenti 1300 Export. Favourite thing’s about my classic? Everything,it is a Mini,but finished of with a bit of Italian flair. I think it is about 300 euro’s fully comp. If you could buy a MINI/Mini, what would it be? I think it would be a new Mini because i have a classic already,so i would opt for one of the new Mini Cooper “S”,with the JCW pack,and the colour would be a Cream body,and a Black roof,to match my own classic Mini colour’s. Well most people on the planet have heard of the mini car,it is Fun,and if you are lucky to own one ,it is a bit of motoring history you are driving around in. Enjoy every minute of Owning,Driving and Fixing them,it’s Great. It would have to be owning Mini’s of all sort’s over the last 25 year’s and i am still counting,the enjoyment of owning a mini,getting in to my first mini when i was 17,Joining various Mini club’s like this one,Making New Friend’s,Meeting Old One’s,Going to Mini show’s,Going on Mini Run’s,Getting to meet some of the Famous name’s in the Mini’s history the list could go on and on,so that would be my Best Mini Moment,the last 25 year’s of my life and Counting. One Response to "Featured Member – Jon Alexander"
Looking forward to seeing this beautiful innocenti in the flesh on MTI 2010 Jon!